Lucky Ace Poker has closed down. 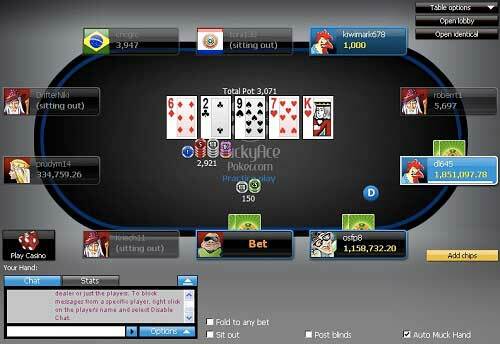 If you're looking to play online poker, we recommend checking out 888 Poker, which is our top online poker room. All links will redirect to 888. Lucky Ace Poker began its operations in January 2008. Lucky Ace Poker is a member of the 888 Network and as such is not open to U.S. players. Even though it is comparatively small, the 888 Network is still quite active and growing. While not yet a top poker destination, the 888 Network is popular and often attracts a good number of players. While they can’t boast the long history of some other sites, LuckyAcePoker is no amateur set-up. LuckyAce has smooth software, excellent support, and creative promotions. Because of the smaller network, LuckyAcePoker doesn’t have a satisfactory tournament schedule for MTT grinders. However, while their selection may be low the quality of tournaments is quite high. Lucky Ace Poker has a weekly 100k Guaranteed, as well as several 20k Guaranteed tournaments. They also run satellites to the upcoming World Series of Poker and The Irish Open. For cash game players there is the normal variety of Hold’em, Omaha, Omaha Hi/Lo, 7 Card Stud, and 7 Card Stud Hi/Lo on offer. As one might expect, most action can be found on the No-limit Hold’em tables. Usually the low-mid stakes games attract most of the action but there are a few high stakes games in peak hours. Lucky Ace Poker is to be found on the 888 Network, which has an increasingly large number of different skins and is currently ranked as the 13th largest online poker network in terms of player pool. The LuckyAcePoker downloadable client is incredibly quick to download, coming in at only 250KB, however during the installation process the installer downloads a large number of additional files which are needed to run LuckyAce. At this time LuckyAcePoker is only available to Windows users, with no sign of Mac or Linux support being added in the near future, which is slightly disappointing. Players from the United States are not able to make accounts on the 888 Network, which rules out joining LuckyAcePoker. International players should have no trouble creating an account and getting in on the action, although it should be noted that the LuckyAcePoker download currently only has support for one language, English, so speakers of other languages may have a hard time. A lot of work has clearly gone into the LuckyAcePoker lobby, and not only does it show but it was also very definitely worthwhile. The new lobby has a number of views, ranging from a very simply interface where one must only choose from eight pictures the poker table that best suits their needs, or a quick seat view were players just choose their stakes, game type and preferred number of players before being seated. Of course a more traditional view which shows all tables and allows filtering through tabs and more advance methods is also there, so you should have no problem finding exactly the tables you’re looking for. The tables themselves feature a very slick and minimal interface, which looks nice and works really well. Animations are smooth, players may choose from one of many custom avatars, and bet and stack sizes are displayed clearly. When it’s your turn to act everything works as it should, and the tables also feature the usual array of preferences and options for everything from multi-tabling to posting the blinds. All in all LuckyAcePoker has a very solid client, the only drawback being compatibility, but if you’re running Windows, are outside the US, and are happy to operate in English, then this is definitely a great poker room. Lucky Ace Poker is on the 888 Network, the 13th largest in the world, which has been growing steadily over the past months. Most of the traffic is concentrated at low to mid stake No Limit Hold ‘Em cash games. During peak hours the Omaha cash games seem to thrive. High stake games appear to be limited to one or two tables of regulars. The tournament action has taken off at LuckyAce. They have beefed up their guaranteed tournaments and offer promotions to increase traffic on ‘off days’ like Monday. Customers will also find satellites to live events such as the World Series of Poker and Irish Poker Open. The 888 Network has been known for a long time as a fishy site with lots of soft games and that idea still holds true. There are a great deal of loose players at all limits, with nice average pot sizes in the No-limit cash games, especially at the lower limits. It’s without a doubt a great place for a low limit player to begin a bankroll, as the lower limit games are just obscenely loose. Most games you’ll come across at Lucky Ace Poker are not what one would consider tough, so experienced players should have no problem at all. Lucky Ace Poker has a nice sign up bonus. Players will receive a 100% Bonus up to $400 on their first deposit. The bonus must be earned at 10 points per $1 within 90 days and is issued in $10 chunks. Sign up using our links to take advantage of this bonus; there’s no bonus code necessary. As you attempt to clear your Lucky Ace Poker bonus, you’ll earn points at a rate of 2 points for every dollar in rake or tourney fees you pay. For every 100 points you accumulate, another $10 will be moved from your bonus account to your real money balance. New players can take advantage of several freerolls LuckyAce hosts for first time depositors. The 888 skin hosts $3,500 freerolls for new customers. You can also check out the $100k First Depositors’ Challenge that runs every Friday. The top 10 players will earn a seat to the Sunday Challenge and have chance at big money. LuckyAcePoker does have a few other promotions. One very cool one is a progressive royal flush jackpot. If you play on these special tables and hit a royal flush, straight flush, or four of a kind, you could win part of the jackpot. 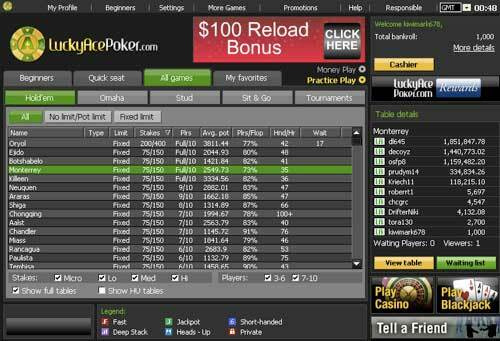 LuckyAcePoker is proud to offers its players frequent reload bonuses to boost their bankroll. By earning as many Status Points as you can, you’ll be well on your way to increasing your status in the Rewards Program. Each tier gets access to special freerolls and will receive Rewards Points at a higher rate with each successive rewards level. These points can be converted to instant cash, and players at the highest level can get up to 36% valueback. A unique wrinkle to the Lucky Ace Rewards Program is that there are frequent Status Fasttrack tournaments that allow you, if you’re lucky, to receive an automatic upgrade to a higher VIP level. Use our links here to join Lucky Ace Poker! Players can find available 24/7 support on the 888 network, one of the oldest and most trusted names in the online gambling industry since 1997. They also have a form on their website to contact them via e-mail. The Lucky Ace Poker support team is there to help you at all times.